Most of us don’t think about cases for equipment until something valuable is broken. Then, faced with what can be a significant financial loss, we think about protecting gear — both while traveling and using it on location. Surprisingly, choosing the right equipment cases can be a complex challenge. About 40 years ago, in the early days of video, equipment was shipped around the world in huge, heavy, wooden Anvil cases similar to what is used today on rock tours. 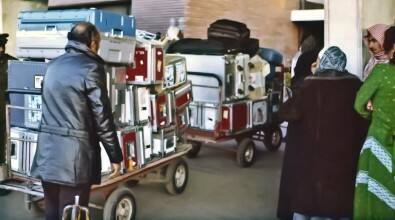 A typical network video crew often traveled with about 25 cases of gear and paid huge excess baggage fees to airlines. Times have really changed. Today, with equipment much lighter and more compact, a working videographer can shoot from something as small as a traditional camera bag. But don’t let that image fool you. Choosing bags and cases for different gear can be challenging and, when done correctly, makes you think through your production workflow in the field. There is no right way to do things, but good decisions can make your life easier on location shoots. In earlier times, videographers did every kind of shoot anywhere in the world and had to be prepared for any event. Today, life in the field is far more specialized. Crews do different kinds of work that require specific kinds of bags for the work they do. Some videographers work only in cities or rural areas and travel only by vehicle. Others fly — some internationally. All these options affect the type of cases needed and used. When the search for bags and cases begins, you need to get a good handle on the exact list of gear you are carrying in the field and how much protection each item needs. Then measure it, being sure to leave room for additions and accessories that might be added later. For glass (lenses) or other more delicate gear, hard cases usually offer greater protection than soft cases, especially if you travel on airplanes. Another issue is the speed of access to gear stored in cases. In the beginning, cases were mainly for protection. Now they are viewed as portable compartments to work from. Different types of videography, like sports, for example, requires fast access to different pieces of gear or accessories. No one wants to quickly unpack layers of equipment to find the one item needed. Some bags are also hard to use. They have too many loops, straps, buckles and other nonessentials which can interfere with efficiency. This can make opening and closing the bag in a rush a difficult task. Be aware of usability before buying a bag. Small annoyances can grow over time when working quickly in the field. Make sure your bag has good quality zippers, see-through pockets, adequate padding, bumpers, buckles and velcro, where needed. You may not think of these things when shopping, but experienced videographers know how important they are in the field when concentrating on doing a job. As one who has a bad back from lifting too much heavy gear through the years, I can tell you it is important to purchase bags and cases that don’t cause the user physical pain. Early cases were heavy and didn’t have wheels. Today, large cases and bags do. Be sure to get reliable, sturdy bags with good quality wheels. Roll them around and make sure they feel solid. For smaller bags, it can be useful to bring a few large books to the store and put them into the bags you are trying out. Is it comfortable on your back and on your shoulders? Make sure it feels good when you lift it. Don’t believe reviews from others on the comfort of bags. It means nothing. Only YOUR back knows for sure whether or not a bag works. For some people, backpacks can take the pressure off the neck. For others, shoulder bags work better. It is a matter of personal preference. In the early days, a downside of backpacks was you had to take them off to access gear. Now, several manufacturers make backpacks that work like a sling for easy access or allow you to swivel the case in front of you. 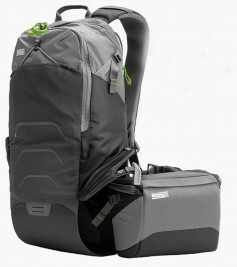 Tenba’s Shootout Sling Bag is a popular sling-type bag, while MindShift’s rotational bags offer swivel access. 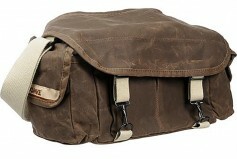 Popular soft shoulder bags in a wide variety of fabrics have served generations of photographers and now, videographers. These bags include classic designs by Domke, Lowepro, Tamrac, ThinkTank, Porta Brace, Ruggard, Arco Video, Case Logic, Manfrotto, Peak Design, Gator and Vanguard. To separate equipment items and give them extra protection, these same manufacturers make a variety of pouches for virtually every piece of gear — from lenses to storage memory to batteries to cables. The choices can be enormous. Even the internal pouches can be either soft or hard material, depending on the level of protection needed for each device. Memory cards can go in a soft case or even a hard Pelican memory case for added protection. For batteries, a good rule is to count the different batteries for all of the things you use and multiply that by two to determine what size/capacity to choose. Specialty cases for tripods, light stands and even C-stands are available with a wide range of quality, hardness and padding options. Again, how will you travel? If you fly, a hard case offers invaluable protection. If you work out of a car, a soft case is easier to carry. Sachtler’s SL2001 C-Stand Bag is a popular wheeled option for C-stands. Finally, large-sized rolling soft bags or hard cases can cut the number of units down and allow for storage of gear in a single place. These come in a variety of configurations, some with interior blocks of foam that can be custom-cut by users or have been pre-cut for storing certain gear. 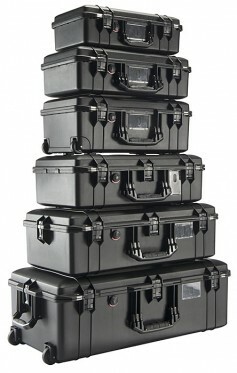 Pelican, SKB, Think Tank, LowePro, HPRC, Nanuk, Porta Brace, Plano, Ape Case, Seahorse and Condition 1 make hard cases. 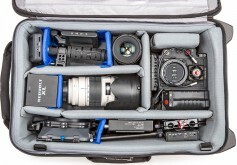 ThinkTank’s Video Transport 20 is designed to get the maximum amount of video gear on a plane with you. It has heavily cushioned bolsters and three-layer interior lining to cradle sensitive gear. Pelican, a leading brand known for 40 years for their hard, rugged equipment cases, has just introduced a new line called Pelican Air, which are hard cases that are 40 percent lighter than their older models. The new Air models are molded from the next generation of Pelican's lightweight HPX resin, a proprietary formula that rebounds without breaking. It has honeycomb structural elements that are actually stronger than solid polymer material used in older models. 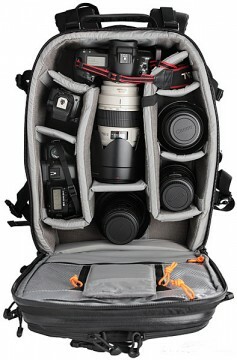 Like most things in the video industry, video bags and cases have rapidly advanced in recent times. Choices abound and configurations are highly customized. Users have to decide and configure these cases for their own use. It is best to take your time, do it right and avoid errors that can cost time and money in the field.